Discover the darker side of Wexford with this collection of spine-chilling tales from across the county, written by Michael Benson, the founder of Wexford Paranormal. Drawing on historical and contemporary sources, including many first-hand experiences and previously unpublished tales, this spooky selection features stories of unexplained phenomenaA term used to describe more than one event or occurrence th..., ghostly apparitions and poltergeistThe term comes from Germany and translates to 'noisy ghost'.... activity and includes tales from well-known locations such as Enniscorthy Castle and Duncannon Fort as well as from private dwellings, including cases handled by Wexford Paranormal. 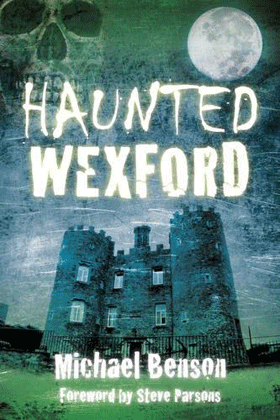 “Haunted Wexford” will enthrall anyone interested in the unexplained and the paranormal, most particularly if you have any connection with Co. Wexford. Available through local bookshops and online through Amazon and The Book Depository.